Stuart Pearce looks destined to join a not-so-seclect group of England coaches who managed their country without success. Literally. Pearce, along with Peter Taylor and Howard Wilkinson are the only three to have not won a game while in charge of England. Of course, Pearce, unlike the other two, may get another chance, but by his own admission, it won’t be anytime soon. It was a spirited performance from England, with a young side coming back from 2-0 down to draw level at 2-2 only for Arjen Robben, to reassert Dutch superiority in with a winner in stoppage time. The Sergeant-Majorish Pearce had the unenviable task of assuming authority after having spent the previous four years subordinate to his predecessor, Fabio Capello. Earning the respect of established, high maintenance English internationals can’t be easy, not least when you’re the man who used to collect their bibs at the end of training. After the defeat to Holland, Pearce was admirably candid about his limitations. “I don’t think after that period I have the experience for the job,” he said. “All I’m doing is buying the Football Association some time. FIFA have confirmed that they will will conduct a routine examination into Bahrain’s 10-0 win over Indonesia. The emphatic victory was the most eye catching result of Asian World Cup qualifying on Wednesday. Bahrain began the match knowing that they needed an eight-goal winning margin combined with a defeat for rivals Qatar in their game against Iran, if they were to go through to the next qualifying stage. Their task was made easier when Indonesia keeper Syamsidar was sent off after just three minutes and the home side could even afford to miss two penalties and still win by a cricket score. Ultimately, though, it was all in vain as Qatar secured the point they required to progress. Gold Coast United owner Clive Palmer has fanned the flames of his feud with Football Federation Australia (FFA) by announcing the launch of an organisation aimed at ending the governing body’s “dictatorship” of the local game. Palmer, reportedly the fifth richest person in Australia, whose club’s A-League licence was stripped by the FFA on Wednesday, said he had registered a body named “Football Australia” to act as an independent watchdog . “Football Australia will look at things like the corporate governance, the rights of fans, the rights of players, payments to clubs, payment to FFA, royalties, issues of that nature,” Palmer said. “We’ll look at specific issues such as why was A$46 million ($49.70 million) spent (and) we only got one vote in the World Cup,” he said, referring to Australia’s failed bid for the 2022 tournament. The FFA, led by Frank Lowy, reputedly the richest man in Australia, said in a statement that it was expecting the action. “Once again an array of unsubstantiated claims and wild commentary have been made by Clive Palmer,” FFA chief executive Ben Buckley said, referring to the media conference. One suspects that the real winners in what looks set to be a long and colourful saga, will be the lawyers. Henri Lansbury scored an amazing long range goal for the England’s Under-21 side against Belgium. It was either an inspired piece of improvisation or a badly overhit cross. As to whether Lansbury meant it, well, even he’s not sure. 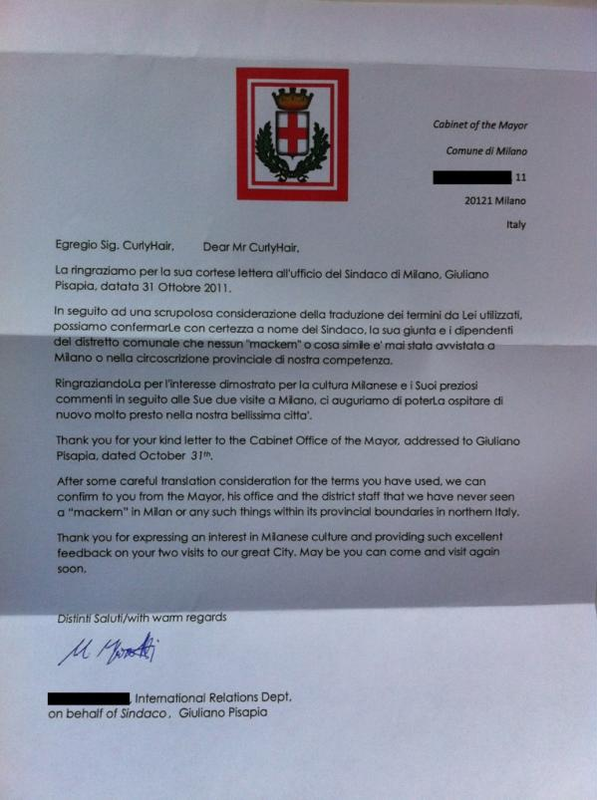 The Mayor of Milan has written to a Newcastle fan to confirm that a Sunderland supporter has never been seen in the Italian city. A Newcastle fan wrote to the Comune di Milano asking whether a Sunderland native had ever been seen in the vicinity. And according to the Mayor, it turns out that they haven’t. The joke was revived when local newspaper The Chronicle asked Davide Santon when he joined the club in August, whether he had “ever seen a Mackem in Milan”. Santon said: “I have never seen them in Milan, no. Maybe I won’t see that for a long time. As a result, Twitter user, iwantcurlyhair2, sent off his letter. And he was delighted with the outcome. Here’s a copy of the Mayor’s reply. Maccabi Haifa faced Dynamo Kiev in a friendly, ahead of Israel’s friendly with Ukraine. The conditions, it would be fair to say, were challenging, especially for Maccabi keeper, Assaf Mendes. The last thing Liverpool need right now is for one their players to be involved in a racially ambiguous episode. So, one can imagine the club’s dismay when news reached them of a Spanish television advert featuring their goalkeeper, Pepe Reina, being taken off the air because of its racial overtones. The advert depicts Reina meeting a tribe in a jungle scene with the Liverpool player – whose name translates as queen in Spanish – attracting the attentions of the tribal leader. The tone of the ad is reminiscent of the the type of tactless remark Prince Philip was apologising for 20 years ago, but in Spain, it would appear that the portrayal of African people remains stereotypical, cartoonish and insulting. Liverpool, who it should be stressed had nothing to do with the advert, have not commented on Reina’s involvement. Perhaps, they’ll produce an official response via the tried and tested medium of the T-Shirt. Eleven former Parma players have been accused of conspiring in fraudulent bankruptcy, following investigations into the accounts of Parmalat, the dairy industry company that filed for bankruptcy in 2003. The players, nearly all household names, are: Thomas Brolin, Faustino Asprilia, Hristo Stoichkov, Lillian Thuram, Hernan Crespo, Juan Sebastian Veron, Enrico Chiesa, Luigi Apolloni, Massimo Crippa, Lorenzo Minotti and Dino Baggio. The eleven are accused of conspiring with former Parma’s owner Calisto Tanzi and Domenico Barilli (the man in charge of players’ sponsorship contracts during Tanzi’s years in charge). According to the prosecution, money was taken out of Parmalat to finance the club through bogus advertising contracts and fake invoices for signed players. Veron apparently received around €5.5 million with Asprillia and Crespo getting €4.4 million and €2million respectively, while Stoichkov and Thuram were the alleged beneficiaries of bonuses worth €550k and €960k. Ricardo Teixeira is to stay on as the head of the Brazilian Football Confederation (CBF), despite speculation that he was preparing to step down amid renewed corruption allegations. Local football federations voted unanimously to confirm Mr Teixeira in the post he has held for 23 years. He is also to remain as head of Brazil’s organising committee for the 2014 World Cup. “The participants declared once again, unanimously, their support for President Ricardo Teixeira,” a CBF statement said after an extraordinary general assembly. The president of Cyprian club Olympiakos Nicosia has dismissed a player’s claim that thugs assaulted and threatened to kill him if he didn’t sign away thousands of euros owed to him in back pay. Venezuelan defender Cesar Alberto Castro Perez has filed a complaint to police alleging that two men forced him at gunpoint to sign documents terminating his contract with the club. Police said doctors who examined the player found bruises to his head and neck. Olympiakos Nicosia president Petros Savva confirmed Perez was owed three months’ pay of about €25,000, but denied his club had threatened or intimidated the player.